Enquirer editor-in-chief: "Story has proven to be true and there is more to come"
(CNN) -- Former North Carolina Sen. John Edwards admitted Friday to having an extramarital affair in 2006 with a woman who worked on his campaign. 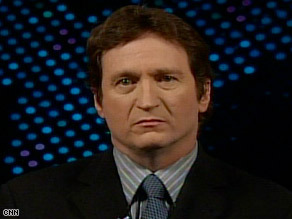 National Enquirer editor-in-chief David Perel says the tabloid broke news of John Edwards' affair in 2007. Edwards has denied being the father of the woman's child, as had been alleged in tabloid reports, and it is willing to take a paternity test. Wolf Blitzer, filling in for Larry King, spoke with David Perel, editor-in-chief of the National Enquirer, who originally broke the story in October 2007. Blitzer also spoke with Alan Butterfield, a senior reporter for the National Enquirer who confronted John Edwards at a hotel in Beverly Hills on Thursday. Wolf Blitzer: What got you guys going in this direction to begin with? David Perel: We received what we thought was a credible tip, Wolf, and we started investigating it. A lot of times when we go down this road and the story turns out not to be true, we abandon it. But the more we dug in, the more information The Enquirer uncovered that was standing up, we were able to prove that, indeed, John Edwards had a sexual affair with Rielle Hunter. We first did the story in October without naming her and then we came back with a much tougher story in December 2007, where we not only named her, but we photographed her pregnant. Blitzer: And at that time, you didn't report that -- what you reported subsequently, that you thought that he was the father. Perel: That's true. We know that Rielle believes that he is the father. And Mr. Edwards today, in his own statement, said he did not take a paternity test. He's now saying that he will take one. We've asked him for months if he would take one and he's ignored that request. Blitzer: (Edwards) said in his statement today, "I only know that the apparent father has said publicly that he is the father of the baby. I also have not been engaged in any kind of activity of any description that requested, agreed to or supported payments of any kind to the woman or to the apparent father of the baby." He does say he would be more than happy to go ahead and have this paternity test, which he says would clear him. Allen, he argues that he had this affair back in 2006. The baby was born just a few weeks ago. He said the affair lasted in 2006, but there was no more affair in 2007. And, as a result, he says he couldn't be the father of this baby. Butterfield: Right. But why is he -- the question we should all ask him, then, why was he visiting her at 3 in the morning at the Beverly Hilton Hotel on July 21, then if he's not the father? He is the father. I mean at least he believes he's the father. Like David Perel said, that Rielle is telling everyone he's the father and he is -- you know, why isn't there a name on the birth certificate? There are still a lot of questions that Mr. Edwards needs to answer. Blitzer: And this other Andrew Young, who says he's the father, you don't believe him. Blitzer: What happens, David, if he does take the paternity test and it doesn't match and it shows he is not the father? Perel: We'll publish that. I've made the offer to him repeatedly: take a paternity test, whatever the results are, we'll publish it. He has refused to do that, as he's been calling this story lies and tabloid trash and lying to the American public. Unfortunately, I think the only reason he came forward and admitted the affair is because we did catch him at the hotel meeting on July 21 and we did publish a photograph this week in the National Enquirer showing him holding the baby. We can also reveal that in addition to that meeting, he met at the same hotel a month before with Rielle Hunter and the baby, so his actions are what counts. His words have proven not to be credible. Blitzer: I guess a lot of people question the reporting of the "National Enquirer," in part, David, because you pay sources for information, is that right? Perel: Wolf, we do pay sources for information after it checks out as credible and accurate. I think, in retrospect, nobody can deny the accuracy of these stories. We've been reporting on the affair for about 10 months now. He says his statements were 99 percent truthful and yet he told the American public while running for the highest office in the land that he did not have an affair, that these were lies, lies? This is a character issue, and he still insists he's 99 percent truthful? I think the truest thing that he said today in his statement was when he admitted that he's narcissistic. Blitzer: Did you pay any sources in connection with this particular story involving John Edwards? Perel: Wolf, we pay for photographs. We pay for information when it's accurate. We have no problem doing that. And in this story, you know, whether we did or we didn't, I'm not going to say. It doesn't matter. You can assume we did. The thing that counts is the story has proven to be true and there is more to come.